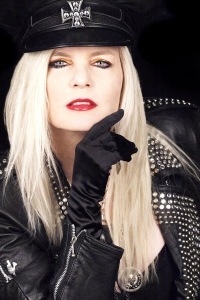 Sally Steele was born in Indianapolis, Indiana and is the publisher, founder, CEO and Editor-In-Chief of Vegas Rocks! magazine. Sally Steele was born in Indianapolis, Indiana and is the publisher, founder, CEO and Editor-In-Chief of Vegas Rocks! magazine. She also contributes as the head writer and photographer. Sally began her early career in photography and later spent time in various music projects and acting roles. Steele was born and raised in Indiana, and took her first interest in rock and roll music as a young child while watching The Beatles Animated Series which aired in the mid 1960s. At age 14, Sally started photographing celebrities and rock bands such as Kiss, Aerosmith and Black Sabbath. At age 16, Sally started singing in local rock bands and after high school, she moved to Japan to play in a Cover band for a brief tour. After one year of select performances, Sally decided to relocate to the vibrant rock scene which was taking place on the Sunset Strip in Hollywood, California during the early 1980s. While in Hollywood, Sally pursed a career in music and acting. She did several bit parts in movies and television and also starred in several music videos which included “Little Lady” by Duke Jupiter and “Hungry Eyes” by Eric Carmen. She also had her own music video featured on MTV’s Basement Tapes in 1988. In the early 1990s, when the hair metal music genre was in decline, Sally moved to Nashville for a short while before relocating again to Las Vegas. Steele attempted stand-up comedy, played guitar when she could and worked as a cocktail waitress before becoming a chauffeur. In 2010 Steele hosted, created and produced the 1st Annual Vegas Rocks! Magazine Awards. With help from musicians including Dee Snider, Lita Ford, James Kottak, Lemmy Kilmister, Glen Hughes and many others, it was the first of her Vegas Rocks! Magazine Awards shows in Las Vegas. The Vegas Rocks! Music Awards is now an annual event which takes place each year in August and simultaneously recognizes the anniversary of Vegas Rocks! Magazine. On August 26, 2012, the Vegas Rocks! Music Awards was streamed live to a worldwide audience on AXS TV. The 2014 Vegas Rocks! Music awards will take place Sunday, November 23rd at the Palms Hotel and Casino. There is no music on file for this artist.